SAN FRANCISCO, CA--(Marketwire - October 20, 2010) - WaterField Designs, a San Francisco manufacturer of custom-fitted computer cases and bags, introduces two new laptop SleeveCases and Suede Jacket Sleeves made specifically for Apple's just-announced MacBook Air 11.6 inch and 13.3 inch notebooks. Manufactured locally in San Francisco, these stylish, custom-fitted and protective Macbook Air cases will begin shipping by October 29. The form-fitted SleeveCase combines a nearly indestructible ballistic nylon shell with a high-grade neoprene interior to absorb shock and cushion the MacBook Air against bumps and bruises. Users can customize the SleeveCase to suit their individual needs -- choosing either a horizontal or vertical orientation with an optional padded front flap, shoulder strap, and/or Piggyback accessories pouch. Trim options include a new distressed brown leather option or the classic eye-catching grey-checkered Indium. Toss the SleeveCase into another bag or sling it over your shoulder to travel light. Those interested in an ultra-lightweight yet protective case can opt for a Suede Jacket Sleeve, now available in snug, custom-fitted sizes for each of the new MacBook Air models. The Suede Jacket Sleeve, made from 100% scratch-free Ultrasuede®, can double as a screen cleaner for this and other electronic devices. Two loops on either side plus a loop at the bottom aid in the insertion and removal of the MacBook Air. Neoprene padding lines the bottom of the Sleeve thus protecting the most exposed area of the device. It's a classy tuxedo for the MacBook Air. "Our new custom-fitted cases help accentuate the portability of the MacBook Air," explained Gary Waterfield, Chief Designer. "They're compact, they stow easily, and they're highly protective. And, the distressed leather trim option is just gorgeous." SleeveCase size 11-1 for the 11.6 inch MacBook Air: $37. Black Ballistic Nylon with Choice of Grey Indium or Leather (+$10) trim. Options include: Front Flap ($15), Simple Shoulder Strap & D-rings ($12), Suspension Shoulder Strap and D-rings ($22.00), the Piggyback ($25). Suede Jacket Sleeve for the MacBook Air 11.6 inch: $25. For 13.3 inch: $29. Color: Black. 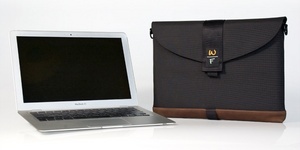 WaterField Designs manufactures custom-fitted, high-quality cases and bags for a full-range of laptop computers, iPods, cameras and other digital gear. All products are manufactured to exacting standards in San Francisco. More information is available at www.sfbags.com. WaterField Designs, SleeveCase and Suede Jacket Sleeve are trademarks of WaterField Designs. Other company and product names may be trademarks of their respective owners. Gary of WaterField Designs demonstrates use of the WaterField Designs SleeveCase. New custom-fitted sizes available for all MacBook Air Models.